"Do you know what the Preservation Room's for?" "Delicious Jams and Jellies?"..."No." 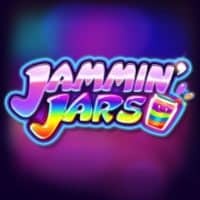 I played Push Gamin’s Jammin’ Jars this weekend. Jammin’ Jars is a colourful 8×8 match/reactor layout game with free games and sticky Jam Jar wilds. 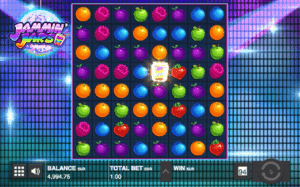 The game seemed simple enough in an attempt to capture the theme of the Bejeweled-like games. If you are not familiar with Bejeweled, allow me to describe it. You receive a large board of various jewels, and you try to group them together. When you get a large enough group of jewels that are alike, the group is destroyed, you get a certain number of points, and gravity causes the jewels that sat on top of the destroyed group to fall down. Empty spaces at the top are refilled with more jewels. There are a few titles like this out at the moment, another good one to check out is Play’n Go’s Gemix which is normally within most online casino’s top 20 performers. This game is similar, but it does not let the player move the jewels around. Also, instead of jewels, you get fruits. So, at the start of every game, you get a whole new 8×8 screen of different fruits, and if you get a grouping of like fruits, they disappear, the top fruits drop, and the empty spots are refilled with more fruits. Both the added features of this game related to the Jar of Jam. The Jar of Jam is the wild symbol. If you get a win with any other symbols, all the symbols participating in the win get destroyed when the win is paid, but not the jam jar. When the jam jar participates in a win, it stays alive on the screen, moves 1 spot over to one of the vacated locations before the fill-in symbols come into the screen, and it receives a multiplier of 2. 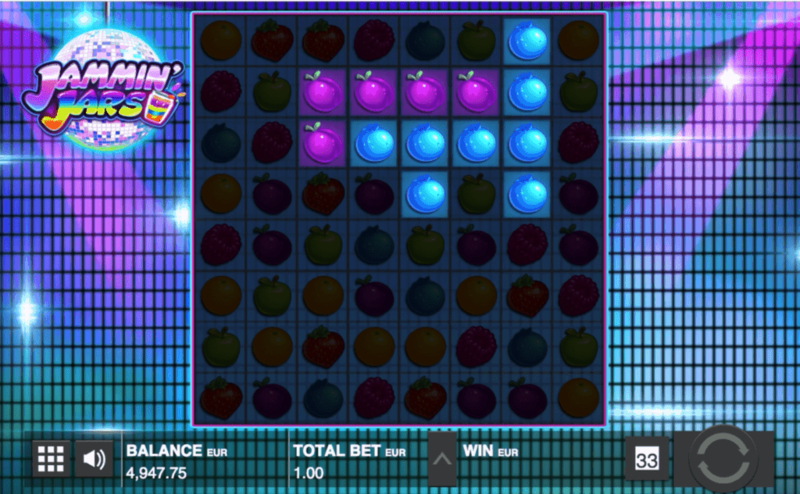 If the jam jar participates in a win in a second screen, the multiplier goes up to 3, and so on. During free games, I saw a jam jar get a multiplier of 9, so I am not sure that there is a cap to the multipliers. Speaking of free games, the jam jar also acts like a scatter trigger for free games. 3 or more jam jars trigger 6 free games. 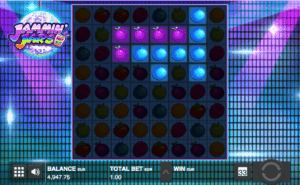 During these free games, the jam jars stay on the screen with their respective multipliers increasing with every screen where they participate in at least one win. This feature is more frequent than free games, but it awarded me so little in comparison to my bet, that it felt anticlimactic. One more forgettable feature that I almost forgot to mention. The game has a “Rainbow” feature that is not available during free games. When your spin gets stuck, very rarely, the game awards you with giant fruits. These giant fruits overwrite the smaller cells below them, and award you a win of the corresponding fruit. The symbols are all regular fruits. The Strawberry being the highest paying symbol, and the blueberry being the lowest paying symbol. And the jam jar is the wild. All the symbols have a simple animation, and they all look ordinary. The jam jar looks cute, as it is the only symbol with a face, and it is animated in every screen it appears, whether or not it participates in a win. The backdrop of the game could not be more ordinary. It is tessellated rectangles. To give a better idea of the volatility of the game. I played 500 games at a cost of €1 each. I ended my session down €158. In that session, I had 3 free game triggers, and all resulted in wins, one of which was more than €100, and two were over €20. So, for the remaining games, I lost all my winnings from my free games plus €158. Meaning that if we exclude my free games, my session took €300 in 497 regular games. We’ll say €0.60 was how much I was losing in each base game on average in my session. It is of course unfair to the game to exclude the free games, as they are an integral part of the game. It’s just that the base game by itself is boring, and there are not enough free game triggers to keep you involved in the game. My session’s fair RTP calculation is: 68.4%. Not super stellar, or even appealing, but that’s just my session. 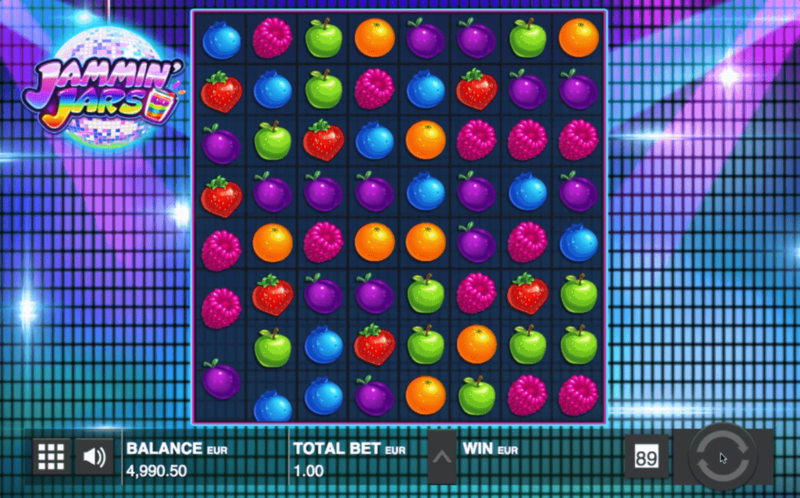 The game tries to have a disco theme for the backdrop. There is a disco ball next to the play screen, and there are spot lights shining across the tessellated rectangles of the backdrop. Not much to see there. The music for the game is as repetitive as it is for all other games, but it was not the kind of music that will cause me to mute my browser’s tab after listing to it for 10 minutes. After a few minutes, forgot it was even playing, so it wasn’t memorable, but it wasn’t annoying. I played the game, and noticed that it was really difficult to even get my bet back. Wins were not very common, and when they did happen, they were a mere fraction of my original bet. I went to check out the paytable to see just what kind of a combination I would need to just get my bet back. It turned out that I needed an 8 of a kind combination of the highest paying symbol to just get my bet back. To top it off, I needed at least a 5 of a kind combination to get 4 cents out of a bet 1 euro back. This means that most of the times I was a “winner”, I was in fact a “loser”. 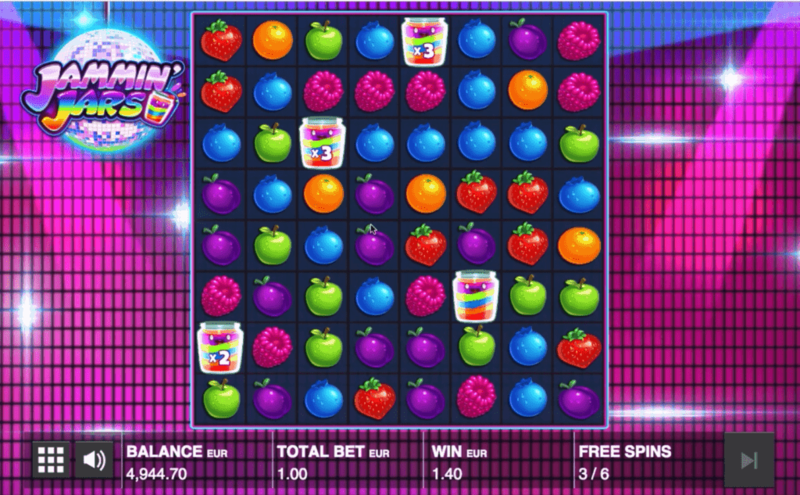 I would get screens with 3, or 4 wins from different fruits, and still came up short of matching my bet. If you are a player of Bejeweled, I can see you being attracted to this game to try it out, but I can’t see you wanting to stay playing it very long. I wanted to play it just long enough to trigger the free games, and I did play long enough to trigger them three times. However, if not for the sense of duty to get the full experience of the game, my urge to abandon the game without seeing the free games was greater than my curiosity to experience the free games. That being said, I would have made a mistake in walking away early, because it feels like this game is heavily tilted towards putting most of the RTP in the free games. They were difficult to trigger, but when I did, I got very nice wins. In one trigger, I got over 100 times my bet, and in the the other triggers, I got over 20 times my bet. Everything is straight forward, easy to understand with decent help screens. The free games are fun, with decent pays coming. Jam Jars are pretty original. Base game RTP is terrible with a lot of stinker pays. Volatility is wrong in that the Free Games don't trigger enough.